This 4+ km trail is in Waterloo Region. 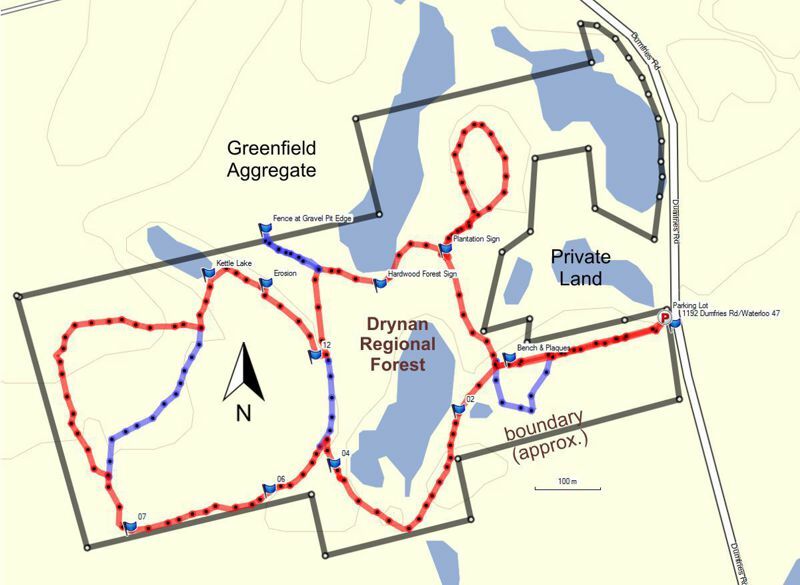 NOTE: Drynan Regional Forest and Dryden Tract are two different entities. Note the different spelling. Drynan (this web page) is managed by the Region of Waterloo. Dryden Tract (not covered on this web page) is located nearby at 1192 Alps Road [43.326742, -80.386927] and is managed by the Grand River Conservation Authority. What and where is Drynan Regional Forest? Drynan is one of about 17 regional forests within Waterloo Region (MAP) and created under the Ontario Agreement Forest Program (AFP). The Drynan Tract is 44.8 ha (110.7 A) and the parking lot is located at coordinates 43.304034, -80.392810 (1192 Waterloo Road 47/Dumfries Road). The parking lot will accommodate several cars. The main trails tend to be wide and appear to be old logging pathways but there are a few others that are footpaths. For those looking for shorter hikes this is a fine spot. Agreement forests were started to reclaim land that had been cleared for agriculture but which was not being used nor was ideally suited for this activity. Some of these lands were abandoned and had associated environmental problems, such as soil erosion and flooding. According to the Ministry of Natural Resources (MNR), such forests included management planning, marketing, and other duties to ensure effective rehabilitation of the lands. Ontario has been actively setting up agreement forests for over 75 years. Under the AFP, MNR established contracts with 28 municipalities, 26 Conservation Authorities, a federal commission, and a publicly incorporated company. The agreements encompassed approximately 130,000 hectares (321, 237 A) of land and resulted in the planting of approximately 147.5 million trees in southern Ontario overall. The Drynan Tract is situated in a geographic area known for its aggregate (gravel) pits. The geomorphology of this area was influenced by glacial/fluvial activities in the past. The relatively short trail system takes you along a path through red pine and walnut plantations to a small lake. The dense plantation stands are ideal cover for many animals. As you continue there is more plantation and then you enter a typical Carolinian oak-hickory forest. This area is hilly and contains several small kettle lakes and swamp-like depressions. It is an ideal area for fauna (e.g. birding) especially if your group is small and quiet. Walks in Drynan are lovely and in winter, after a significant snowfall, one can enjoy cross-country skiing and snowshoeing. Drynan is also used for education by local school groups. One may occasionally see evidence of geocaching. Due to the kettle lakes and swampy areas there may be times when the mosquitoes will be looking for some blood. It is reported by some observers that Drynan contains a species of oak tree called Hill's Oak (Quercus ellipsoidalis). According to The Arboretum website, University of Guelph, "Hill’s Oak is an uncommon tree species in Canada; however, it occurs in Ontario west of Lake Superior and Lake Erie on sandy soils in open and disturbed areas. 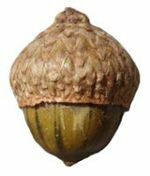 Hill’s Oak is very similar to Pin and Scarlet Oaks but often distinguished by its conical cupped acorns." Note: If you scroll down on the Arboretum web page, you will find an "Ontario Tree Atlas map of non-planted Hill's Oak from 1995-1999". Another online reference to Hill's Oak and how one may be able to distinguish it from Black Oak is located at https://natureinquiries.wordpress.com/2010/09/10/hills-oaks-resolved/by Carl Strang. The way plants are classified by researchers changes. Today (2017) more emphasis is placed on classification at a molecular/DNA level. I recall a park naturalist saying that oak trees tend to hybridize easily so trying to determine the exact species on site is often impossible.